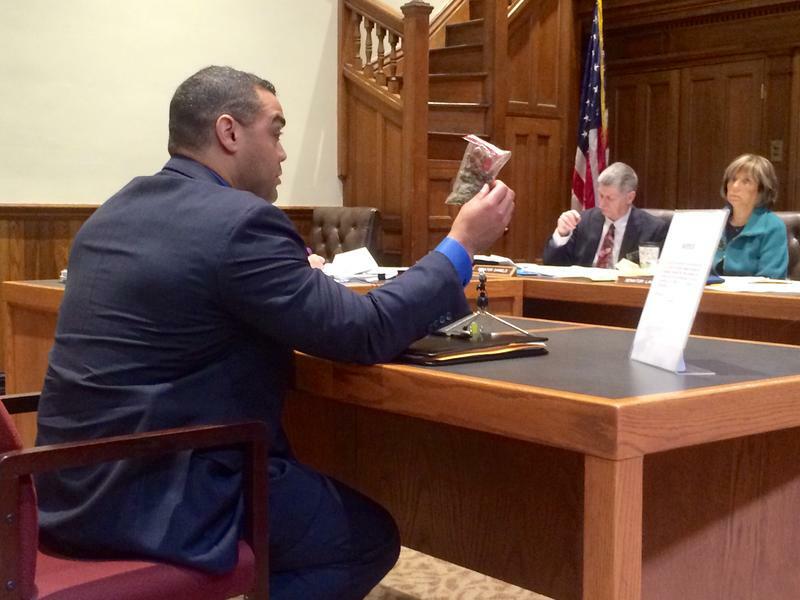 Lt. John Encarnacao of the State Police's narcotics unit holds up a half-an-ounce of marijuana while testifying against the decriminalization bill In April stressing that this is no little amount. After a long debate Thursday evening, the Senate decided to table a bill that would decriminalize the possession of marijuana, essentially killing it this session. Under the bill, those found with half an ounce of marijuana or less would receive a $100 fine rather than be charged with a crime. Currently all other New England states have similar laws already on the books. Although a similar measure has passed the House numerous times, it has never passed the Senate. Sen. Sharon Carson of Londonderry says with the state battling a heroin epidemic, this is no time to be soft on drug crimes. “I do not need to remind you of the people in our lives who have been affected by addictions as there is not a person in this chamber, or in the balcony or listening online who has not had some sort of impact,” she told her colleagues Thursday evening. Last year there were more than 320 drug-related deaths in New Hampshire. Editor's note: An earlier version of this story reported that Gov. Hassan said she would have vetoed the original decriminalization bill. While Hassan had said she did not support the bill, she did not say she would veto it. New Hampshire has a reputation as a place where liberties are prized yet it’s the only New England state where possessing even a small amount of marijuana remains a crime that can land people in jail. A bill before the state’s GOP-controlled legislature would change that, but first it needs to win the backing of Governor Hassan. A bill aimed to decriminalize marijuana in New Hampshire is now being considering by the state Senate. Under the measure, those found with a half an ounce of marijuana or less would receive a $100 fine rather than be charged with a crime. Currently all other New England states have similar laws already on the books. But in New Hampshire no decriminalization bill has ever passed the Senate, and Governor Maggie Hassan said if it passes she would veto it.